Grubhub and Google are working together to up their own profits at the expense of restaurant owners, and it seems to be working. Recently, Grubhub released its quarterly earnings report, and to say they are outperforming expectations is, to put it mildly, an understatement. Grubhub is doing far better than anyone could have predicted. This fact has helped to drive the company’s stock up by over 25 percent in a relatively short amount of time. Now this once-tiny company based out of Chicago has grown to a massive business worth over $12 billion. Before you congratulate them, though, ask yourself: How did Grubhub earn so much money? The answer is simple: by stealing it from the profits of hard-working restaurant owners all across this country! Unfortunately, much of the blame rests on us, the small-business restaurant owners. We helped to create this monster, and now we are suffering for it. Grubhub has become so commonplace now that a restaurant owner pretty much has to use it, even if it’s no longer in their best interest. Otherwise, they run the risk of seeing a huge drop in sales. For many years now I have been trying to fight this by getting my colleagues at Orders2me (and other places) to simply stop using Grubhub as its default ordering service. Instead, we need to start directing customers back to our individual restaurant websites so the orders (and profits) can go directly to the restaurants and their owners. Until recently, this was strategy was working. By using Google My Business, customers have been able to connect directly to restaurant websites to order, establishing a relationship with that restaurant, while not making the restaurants pay Grubhub’s 15 to 25 percent acquisition fee for each order. Unfortunately, recent changes at Google My Business have made this impossible, and restaurant owners are once again faced with the dilemma of either keeping Grubhub or turning off Google My Business altogether. 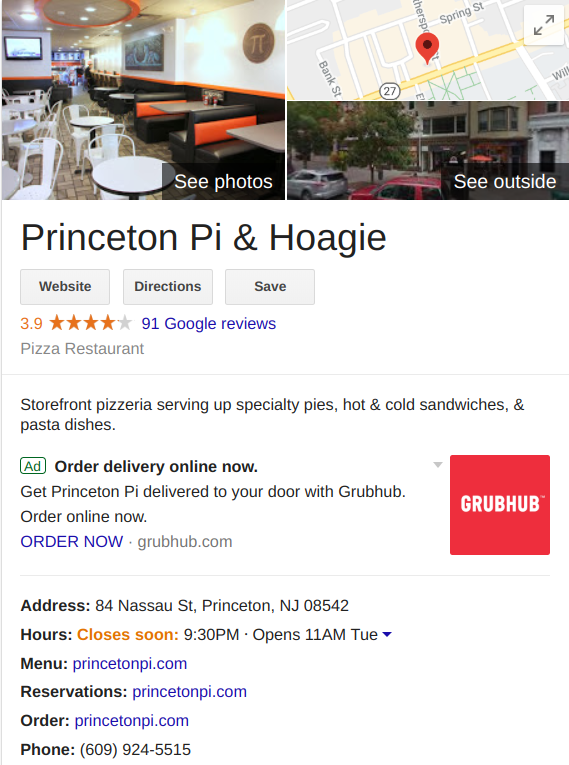 About three months ago, Google made a change to the way Google My Business is displayed that allows Grubhub, as well as other third-party providers, to be displayed prominently on the listing page. This red button acts like a beacon, directing customers to click on it and use Grubhub to order, rather than going to a restaurant’s individual website. This change can spell disaster for these restaurants because now customers are more likely to order through Grubhub, making the restaurant pay more in fees, as each order through Grubhub requires the restaurant to pay an acquisition fee. In addition, this system enables Grubhub to get customers’ information, which increases the chance that the customer will use Grubhub in the future and forgo a restaurant’s site. This sets up the restaurant for a long future of paying these fees, instead of keeping those profits for themselves. Google and Grubhub are going to continue to make massive profits while holding a virtual stranglehold on our industry. Instead of being a FREE business listing, Google My Business is turning out to be something that COSTS us money, instead. I have been trying to find out more about these ad changes, but no one seems to know much about them. Google itself seemed to be unaware of what was going on within their own company. But the damage is already being done. Many restaurants are already experiencing fewer sales via their websites, while sales garnered through Grubhub are up. No wonder Grubhub is able to meet and surpass its expectations so easily! I am pleading with the restaurant community to say “No More!” and fight back. I know this seems like an uphill battle. But if we don’t act now, who will? Many owners have already stopped using Grubhub completely. I urge you to do the same. Please drop Grubhub. This will send a message to Google that your Google My Business listing should promote YOUR business, not someone else’s! If you don’t do this, you can expect to see your profits continue to drift away. When you stop using Grubhub, customers who want your food will still place orders, and the profits will go to you, not Grubhub. You may lose a sale here or there, but your profits will not drop. In fact, they just may go up! Please take a stand now, and urge other restaurant owners in your local area to do the same. Send this message and get the word out to everyone in the community! There are thousands and thousands of us restaurant owners. Our strength will come through those numbers! We must act now, before it is too late. Share this, and comment below!